Event 4/11: John Kerry's Framework: More of the Same, or a Fresh Approach to Israel-Palestine Peace? Americans for Peace Now, The American Task Force on Palestine and J Street U GWU present Lara Friedman (Director of Policy and Government Relations, Americans for Peace Now) and Hussein Ibish (Senior Fellow, The American Task Force on Palestine) were hosted by J Street U at George Washington University for a talk on the current status of Israeli-Palestinian negotiations. 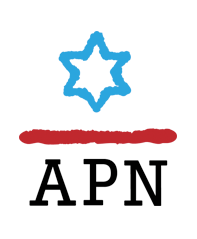 On March 18, 2014, J Street U hosted Lara Friedman (Director of Policy and Government Relations, Americans for Peace Now) at the University of North Carolina at Chapel Hill for a talk on the APN's work and the current status of Israeli-Palestinian negotiations. This month, APN's Lara Friedman (Director of Policy and Government Relations) was hosted by J Street U chapters at the University of Michigan, Oberlin College, and Kenyon College. Ms. Friedman's discussions with students centered on the current status of the Israeli-Palestinian conflict, Israeli settlements in the West Bank, and the issue of Boycott, Divestment, and Sanctions against Israel.